Topics: Leather Bound Bible Store, Leather Bound Bible Esv, Hcsb Marine’s Bible, and Hcsb Sailor’s Bible. 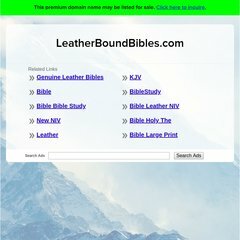 leatherboundbibles.com KJV/Amplified Parallel Bible (Bonded Leather, Black) - Leather ..
leatherboundbibles.com KJV Super Giant Print Bible (Black Genuine Leather – Indexed ..
American Registry For Internet Numbers (Virginia, Chantilly) is the location of the Apache server. Its 2 nameservers are ns1.bluehost.com, and ns2.bluehost.com. Its IP Number is 74.220.219.55.